Need some tips on easy storing? • Inspect your storage space. Your storage space should be clean, have a good working door, and it should be secure. When you rent a portable storage container with Spaces Storage you will always receive a pre-inspected secure storage vault. • Know what packing accessories you will need. Things like newsprint, bubble wrap, tape, rope, old blankets, rags, polyurethane sheeting, furniture or mattress covers, pallets, skids, dehumidifiers, file boxes, storage cartons, or wardrobe boxes are all possibilities. We will deliver your packing items right to your door. You can see a list of all items that we carry here. • Fill your containers to capacity, but don’t overfill them. Half full, or too full cartons might tip over or collapse. Make sure you protect your fragile belongings with packing (newsprint or bubble wrap) and store them near the top of your storage space. • Label your boxes in a way that you’ll remember, or keep a list of labeled boxes at your home or office for easy reference when you need to find something. If you ever need to access your vault while we are storing it simply give us a call and we will arrange a drop off at your house or you can access the vault at our warehouse or office. 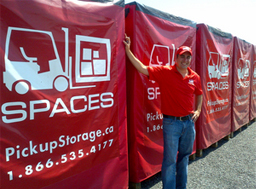 Please allow at least 24 hours notice when accessing the portable storage containers. • Dissemble items like bed frames, tables, etc… (this saves space). Wrap and label each item to make assembly later on easier. Put all hardware in bags and mark the bags as well. • Make sure that your items are clean and dry before storing them. Leave appliances slightly ajar to prevent mildew. • Store mirrors and paintings on end, not flat. • To prevent rusting, rub a small amount of machine oil on metal tools, bicycles, and equipment. • Purchase the insurance, if offered. If your belongings are worth storing, they’re worth insuring. We do offer insurance and it is mandatory to purchase this. Please speak to one of our helpful customer service representatives to learn more. • Drain and clean all equipment before storing. • Keep the more valuable items near the rear of your storage unit. This will prevent others from seeing them when you are in your unit. • Don’t use plastic to cover your belongings. It retains moisture. • Don’t store any food items. This will prevent you from having any unwanted pests such as bugs or animals. • Don’t use printed newspapers. The ink may smudge onto your belongings. • Don’t store any toxins or flammables, such as paint, oil or gasoline.